Being the executor (also known in Florida as the personal representative) of an estate is no easy task. Some people may only do so once or twice in their lives—usually for their parent’s estate and/or perhaps their spouse—thus, it isn’t the kind of role where one can gain practice and become good at it. Not to mention, there’s a significant amount to accomplish in a short amount of time. Find the original will: You will need this to begin probate. Usually, these are placed in a safe deposit box, with the decedent’s estate planning attorney, and/or in safe storage in a home office, such as in a filing cabinet. Safeguard the decedent’s property: This includes canceling any credit cards, as well as safeguarding valuables; perhaps changing door locks, etc. Ensure that any and all valuable objects have been inventoried and placed in a safe location. Order at least 10 death certificates: Distribution of the decedent’s estate can only occur once proof that the account owner is deceased is produced; and the certificates will be needed to access certain assets of the decedent. Other administrative tasks: Be sure to collect mail and forward any documents that are critical, as well as handle other loose ends, such as cancelling prescriptions, subscriptions, etc. Choosing the right attorney: It is crucial that you choose knowledgeable, experienced legal representation; i.e. an attorney who is familiar with probating wills. Without someone who is experienced, it could take years to distribute assets to beneficiaries. 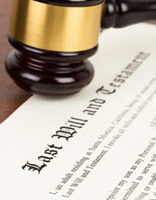 It is the attorney’s job to send the will to all relevant family members, as well as inform them of any paperwork they need to sign, return, and notarize, and relay any guidance that accompanies any relevant bequests. Track Expenses: You will have certain basic expenses, such as a court filing fee, which is compensable by the estate, so make sure that you track all of your personal out-of-pocket expenses paid for estate matters. Contact the accountant (if the decedent had one) to ensure that you are aware of all the relevant accounts and any other relevant information. Also ask to review the decedent’s old tax returns. Keep in mind that you will not only need to liquidate and sell property, but file the estate’s income taxes, and pay any creditors, as well distribute any personal property, pursuant to the decedent’s wishes. Note that as an executor, you are personally liable for any negligent and/or intentional actions resulting in loss to the estate, beneficiaries or creditors of the decedent. After all of the assets have been collected, and creditors and taxes paid, all estate expenses must be accounted for and sent to the beneficiaries with a release for them to sign. Once you receive these releases from the various beneficiaries, they are paid, and you are entitled to be paid an executor commission. At Moran, Sanchy & Associates, our wills and probate lawyers devote themselves to serving our clients in Sarasota, Florida and surrounding areas. Contact us today to find out how we can assist you in probate administration.